Home page > News > Electric industrial heating. Industrial heating - is an integral part of any modern production. Temperature requirements for the manufacturing process and the use of various chemicals inevitably generates a need to create the most efficient heating system in the workplace. Industrial heating is used to maintain the correct temperature level in the industrial premises, hangars, storage hoppers and tanks. Besides, it is separately applied for heating of pipes, cisterns, the ground, etc. In recent years, efficient and versatile industrial electric heating has come to replace steam heating with its huge expenditure of resources. Presently, electric cables and heaters is the basis of industrial heating since they allow us to accurately set and control the temperature, quickly assemble and disassemble the heating equipment, swiftly replace any item in case of failure without disabling the entire system. Electric industrial heating is necessarily used for transporting water, water vapor, natural gas, petroleum, oil, diesel fuel, mazut, bitumen, etc. All of the listed substances react to the temperature drop, some of them crystallize at a lower temperature (become viscous), resulting in disruption of the operating procedure and destruction of the pipeline. In addition to the chemical industry, technical heating is used in the construction industry, in breweries, in the confectionery, dairy, and other factories. deformation of the ground under cryogenic and refrigerating installations, etc. 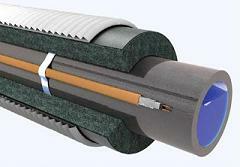 Electric heating cables are most commonly used for direct heating of the pipeline and underground heating. They are wrapped around hard-to-reach piping systems, laid at the required depth underground beneath the concrete constructions while the control system is brought to the surface. Resistance cable is a constant source of heat generation along the full length. It is the simplest electric cable, which relies only on the current. Zonal electric heating cables have a more complex design and are, in fact, independent up to 1m-long cable mini-systems, which can be operated alternately. Self-regulating heating cables are the safest and most durable because they have a special matrix for ambient temperature control. When a certain temperature level is reached, heat supply reduces to prevent the cable from overheating and burning, which can occur to previous types of cables in the absence of control. Heating of pipelines using such electric cable systems requires strict compliance with safety measures and the absence of direct access to the heated areas, since touching the cables during their work is dangerous to humans. As mentioned above, industrial heating serves not only to support the work of individual elements of the production but also for the heating of storage facilities,industrial premises, and hangars. Large areas require a complex efficient heating system. These areas often contain the equipment, tanks, and cisterns, which are simply unreasonable and impossible to heat by means of cables. Electric industrial heating, in this case, will be provided by the radiant heating system. Industrial series infrared heaters are presently sufficiently powerful, fire-safe for any operating procedure, and have a lifespan of 20-30 years. Radiant heating directly warms the surface, without giving off heat to the air, which contributes to energy saving, so the efficiency of such a system is 95%. Industrial infrared heaters are versatile and suitable for heating in virtually any environment. Electric industrial heating via infrared rays will allow to precisely establish operating time, temperature and zonal heating due to connecting to the thermoregulatory system. Thus, heating of piping, tanks, and other elements will be stable. Infrared heaters are easy to attach to lighting appliances, ceiling joists, and other beams, as well as on the walls at a certain angle, which allows accurate arranging of heat sources over the equipment and workplaces. Teplov infrared panels have all the necessary documentation, the European quality certificates and have already been used for many years in the Ukrainian industry.